This historic Onion Shed, restored in 2002, was one of several onion sheds in Farmersville, built by the railroads for the packing and shipping of the Collin County Sweets. In 1925 local farmers began planting onion crops, and by 1935 Farmersville was known as the "Onion Capitol of North Texas.” Migrant workers came each January to plant the onion slips. In late May or June, the crews returned to harvest the onions. 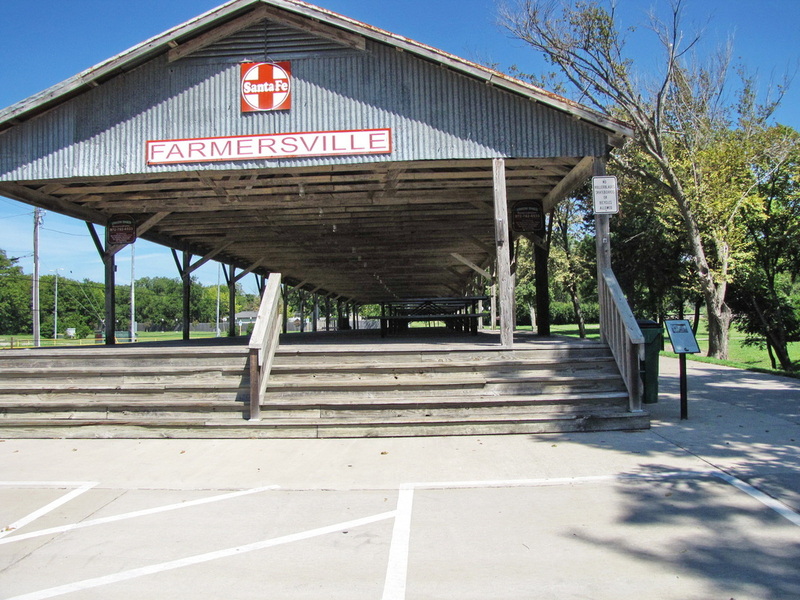 Many of Farmersville's young men worked on the sheds, grading and sacking the onions to make them ready to ship by rail to places all across the country. The smell of onions permeated the town. The Collin County Sweets were mild onions, popular for their sweet flavor. For several years, during the height of the season, an onion festival was held, complete with a parade, marching. bands, and an onion queen, Queen Noino (onion spelled backwards). The onion industry declined as growers in south and west Texas and other areas developed onion varieties suitable for their soil and climate conditions. These onions were not as perishable as Collin County Sweets and were easier to ship.